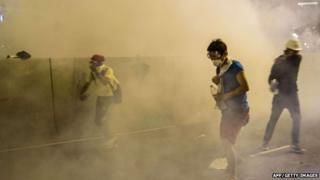 The British government has said it is "concerned" about the situation in Hong Kong after clashes between police and pro-democracy activists. Tens of thousands of protesters remained on the streets of Hong Kong on Monday, defying attempts by the Hong Kong authorities to make them leave. A Foreign Office statement called for the rights of those demonstrating to be protected. But China says other countries should not interfere in Hong Kong's affairs. UK Deputy Prime Minister Nick Clegg tweeted: "I sympathise a great deal with the brave pro-democracy demonstrators taking to the streets of Hong Kong." Hong Kong was a British colony until 1997, when it was handed back to China under an agreement which allowed the territory a degree of autonomy and guaranteed certain basic freedoms, including the right to peaceful protest. Hong Kong was allowed to keep its economic and social systems and move towards democratic elections under the "one country, two systems" formula. However, China has a veto on any proposed political changes, and this has frustrated Hong Kong's pro-democracy campaigners. The current demonstrations are the most widespread since the 1997 handover, with protesters calling for a free choice of candidates in Hong Kong's leadership elections in 2017. China insists that only candidates it has approved will be allowed to stand. On Friday, 61 people were arrested and 30 hurt after clashes between the police and crowds gathering near the Hong Kong government's headquarters. The group organising the protests, Occupy Central, accused the police of "unnecessary force" and of using pepper spray to disperse the demonstrators without giving any prior warning. Thousands joined the protests in central Hong Kong over the weekend, despite attempts by the police to restrict numbers by closing roads into the area and calling for people to go home. Overnight, riot police used batons and tear gas to try to disperse the crowds. But on Monday, protesters continued to gather outside the government HQ and block streets in Hong Kong's business area, while the demonstrations spread to other parts of Hong Kong. The statement from the Foreign Office reads: "The British government is concerned about the situation in Hong Kong and is monitoring events carefully. "It is Britain's longstanding position that Hong Kong's prosperity and security are underpinned by its fundamental rights and freedoms, including the right to demonstrate. "It is important for Hong Kong to preserve these rights and for Hong Kong people to exercise them within the law." On Twitter, Mr Clegg wrote that the UK was "committed" to the "one country, two systems" formula. "Universal suffrage must mean real choice for the people of Hong Kong and a proper stake in the 2017 election," he added. The Chinese government has reacted angrily to international concern over the protests. A foreign ministry spokesperson, Hua Chunying, told a news conference in Beijing: "Hong Kong is purely our internal affair. We are resolutely opposed to any foreign country using any method to interfere in China's internal affairs." Hong Kong protests: What changed at Mong Kok?